Figure 69. Buchanan sounding apparatus and water bottle. 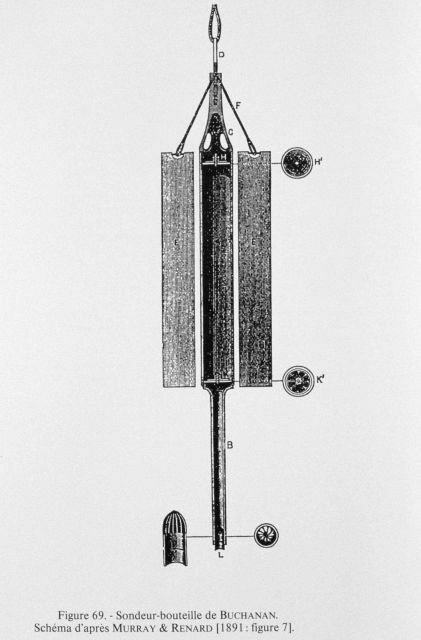 This instrument was devised by John Buchanan for the simultaneous collection of a bottom sediment sample and a water sample at the bottom. Schematic drawing from: Murray, J. and Reynard, A. F., 1891. Report on the scientific results of H. M. S. Challeng er… Deep-sea deposits, pp. 1-32. Figure 7.